A few weeks ago, I attended a fundraising dinner for a rescue mission in my area, which supported homeless men. I’ve attended this event for the past few years, and each time the chosen speaker from the mission would share inspiring stories of the recovery and success of some of the men they’ve supported. These stories were encouraging, captivated the audience, and inspired them to continue to support the mission. They would also share statistics of all the meals and beds they provided, and all the great programs they were running. These were awesome stories of success! But this year was different. This year, the speaker began by sharing three stories of tragedy. Three stories of men, that despite their best efforts, they were unable to help. The end of each story resulted in death or long-term imprisonment. The speaker shared these stories to share the reality of what they do. The reality that sometimes they fail. That despite all the work, all the heart invested, all the tears, that sometimes, they still fail. I don’t share this story of failure to damage our hope or resolve, but to encourage us not to be afraid or ashamed of our failures. In education, it seems it is never okay to admit that we will fail some of our students. I use the term “fail” in reference to the reaching the goals we want to accomplish with all of our students. The reality is that all of our efforts, interventions and supports will not be enough for some students. The reality is that some things are beyond our ability to support. So when this happens, it can create shame and feelings of failure among teachers and administrators. As a principal, I’ve recently experienced situations where we’ve felt like we did everything in our power to help and support a student, but in the end, we failed. We didn’t fail at trying or doing everything within our responsibility and power necessary to succeed. We failed in achieving the goal of helping all students be academically and behaviorally successful. We may have made the decision that another placement was more appropriate, or we eventually had to promote the student despite failing grades, but we didn’t meet our goal. We failed. As a leader, it’s hard not to feel guilty and down about these experiences with failure. After all, when I look at social media, all I see is success stories and celebrations. But how often do schools share their failures? In what way do we discuss these situations? I am not saying we should promote these situations on our Twitter feeds, but how do we share and discuss them within our PLN’s? Or are they just ignored and hidden away, not to be discussed in public. I wonder how much we could grow by sharing and discussing our failures. After all, it is a least a small part of our reality. We should never give up hope, diminish our efforts, or let this reality change what we do. We should never let our failures stop us. However, we need to admit this is part of our reality, discuss it, and use it to help us improve moving forward. Where do you discuss your failures openly and honestly? How can we safely share failures within education? Grading practices can have a major impact on student learning. However, grading is often an overlooked aspect of classroom culture. We must remember that everything we do impacts our relationships with students. 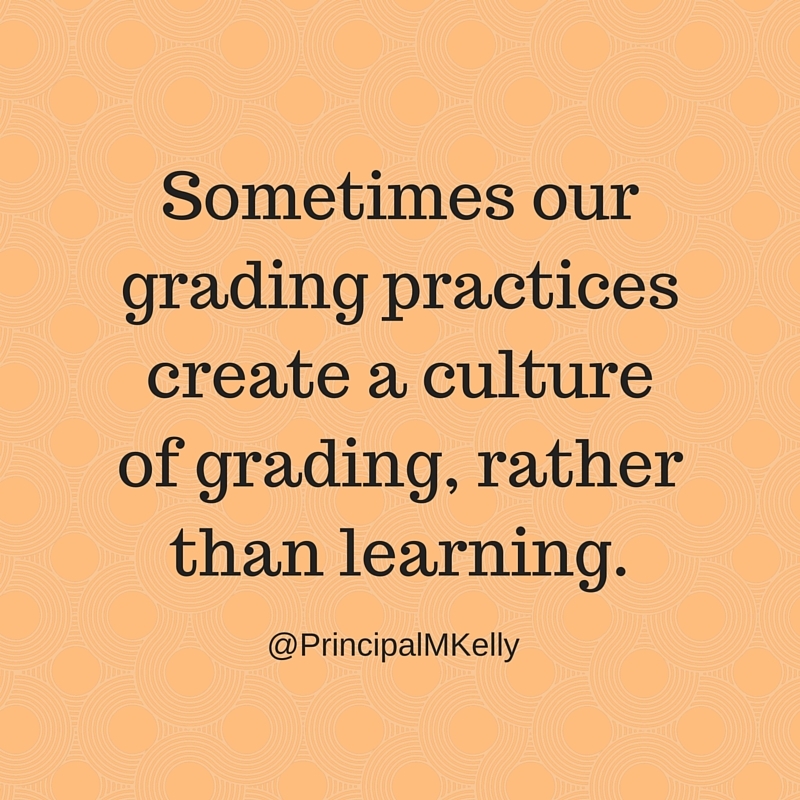 Sometimes our grading practices create a culture of grading, rather than learning. We need to make sure our grading practices promote trust, reflection and growth, not a “gotcha” culture of rewards and punishment. The purpose of grading is to accurately communicate learning. They should be used as a communication and reflection tool to promote student growth and learning. Grades should not be for rewarding, punishing, ranking or sorting students. Most teachers would agree they would like their classroom to be a supportive learning environment. However, many times, their approach to grading sends a different message. For example, when teachers do not accept late work, they are putting the grade in front of the learning. They send the message that the learning demonstrated is not as important as the grade that must be enforced due to the behavior of turning in the work late. When teachers put the importance of behavior in such a high position that the learning no longer matters, they are destroying a culture of learning. Grades should not be used as punishments for student behavior. Too often, teachers hit students with the “grading paddle” as punishment for not following directions on an assignment or failing to follow protocol for submitting work. These behaviors rarely have to do with the learning that is aligned with standards, but instead fall in the category of miscellaneous things teachers choose to grade based on personal preference. Another example is when teachers assign zeros for students who don’t complete assignments and just move on. Many teachers will argue this practice is done to “teach” responsibility. However, punishing a student with a bad grade for a behavior doesn’t “teach” anything. If this was a successful teaching method, we’d have much more responsible students. No student would ever get a second zero because they were “taught” responsibility. This is just not the case. The reality is that the student who receives the first zero usually follows up with several more zeros because the teacher didn’t hold them accountable to the right thing, which is the learning. If a student fails to demonstrate the knowledge and/or skills on an assessment, and the teacher moves on to the next unit with no additional follow-up, the learning becomes secondary to pacing and grading. Learning must come first. There must be a level of reteaching and reassessing to show the importance of learning the content or skills to students. When teachers just move ahead and plow into the next unit, they send the message that the learning not attained during the previous unit, really wasn’t that important. How else do grading practices communicate a culture of learning, or grading? Share either view.